Do I have a treat for you guys! 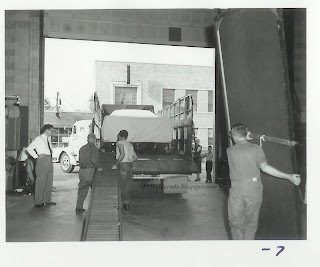 Recently a photo album was uncovered that belong to a GM Photographer from the 50's. Amongst the pictures there was a handful of photos from a photo shoot. 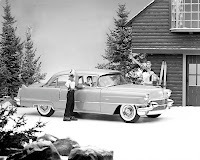 This photo shoot was for the upcoming 1956 Cadillac line up. It was done at a studio in Detroit sometime in late August of 1955. Whether or not this studio was owned by GM is not known but as you will see in the pictures a great deal of care was taken not to reveal the cars to the public, especially the Eldorado! 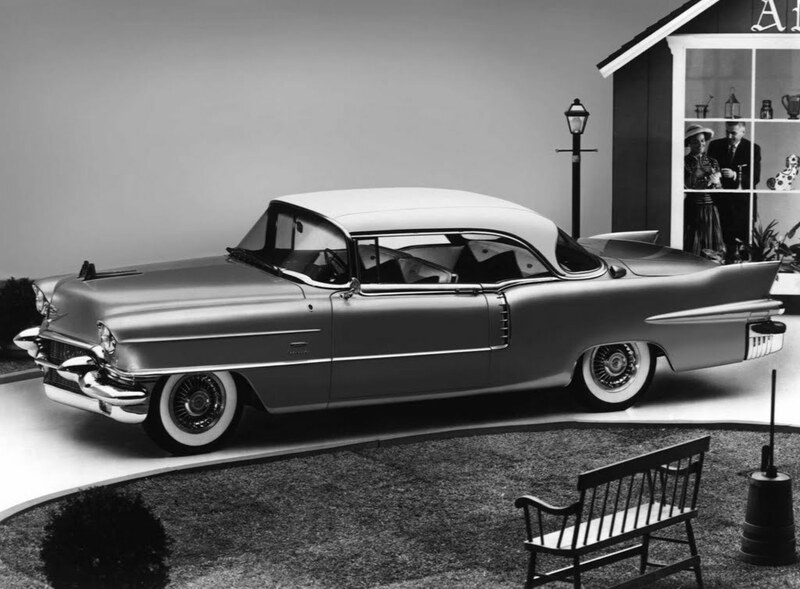 Cadillac always made a first run of each model year car prior to starting a full production run. It usually involved the build of at least one of each body style sometime in August and then by late September or the first week of October the full run would begin of that particular model year. 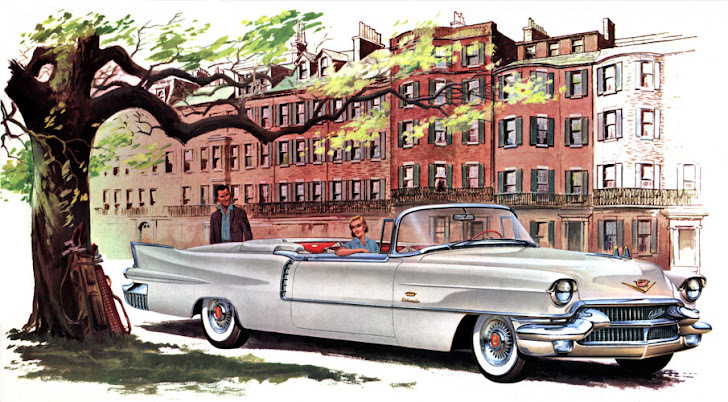 Here is an example of a first run of Cadillacs from 1959. 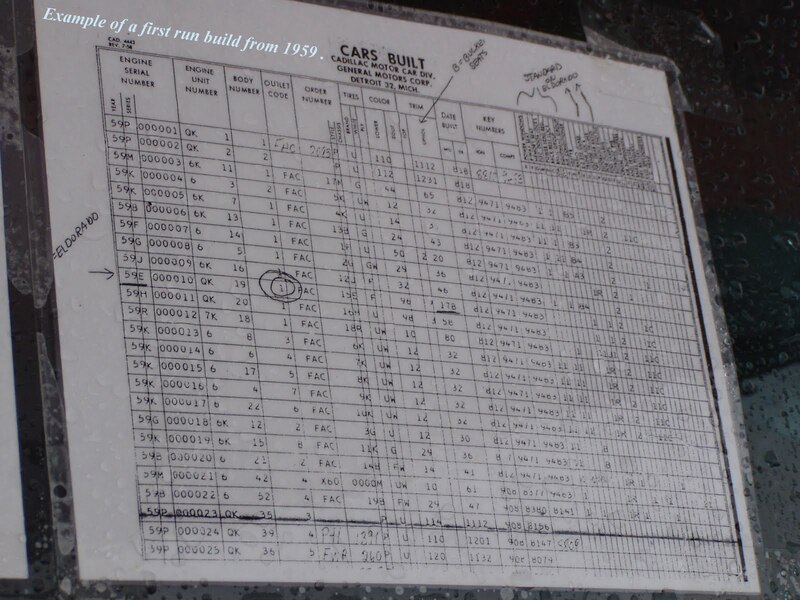 You can see on this 1959 built sheet that the first run of cars were built in early August of 1958 and then nothing was built until Sept 8th of 1958. 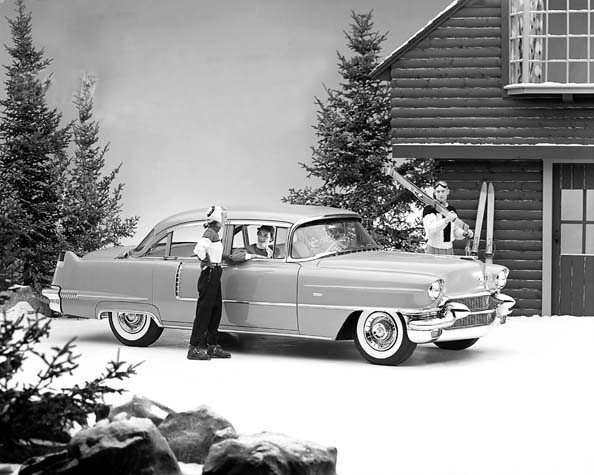 Cadillac did this "first run" to work out the bugs for the production line and to be able to promote the new line up in advance. 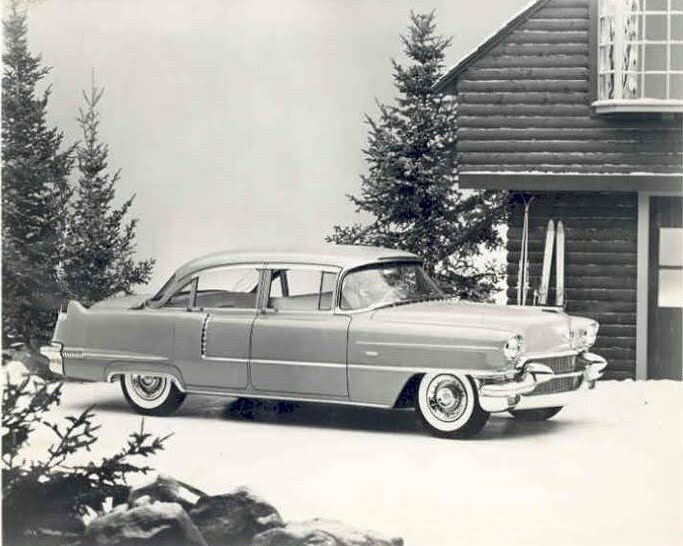 What is interesting about 1956 is, the new cars didn't hit the showrooms until mid-October. 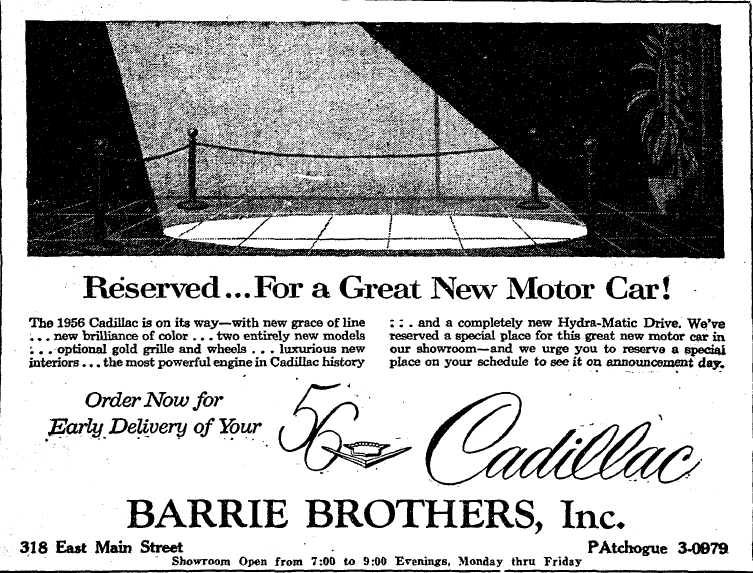 In October of 1955, Cadillac sent out this broadcast advertisement for Cadillac dealers to use. 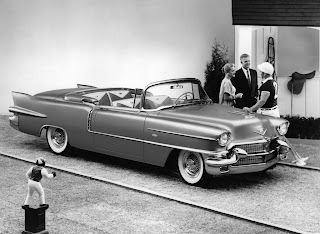 It was the announcement of the new 1956 Cadillac line up arriving within days. 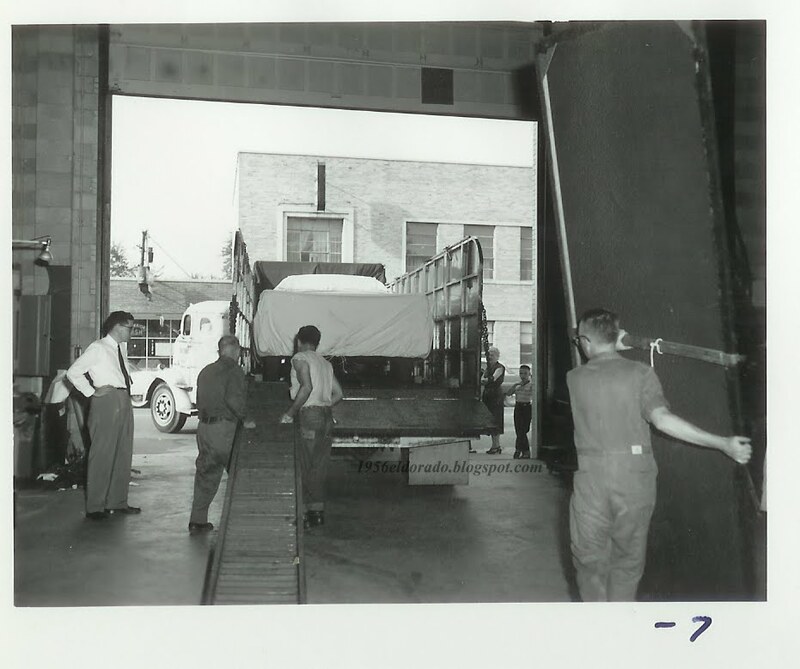 One could assume that full production began in late September or early October of 1955. The reason why it is important to establish this timeline is because the photos you are about to see tell of a summer like setting. Folks are in short sleeved shirts, cars and building windows are open. The trees are full of leaves. 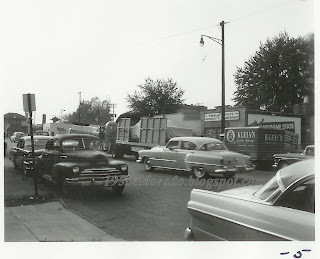 Looks much more like late summer than early fall in Detroit 1955. Let's get to it. In this picture, take a good look at the two trucks double parked in the street. did you notice the very special cargo on board? 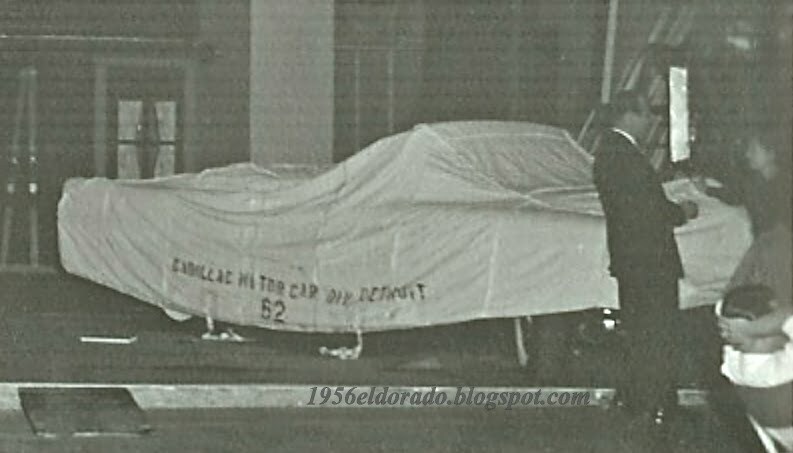 The truck in the center of the picture has the brand new Eldorado Seville under the cover. There is a truck in front of this one that is carrying another Cadillac. The short looking deck reveals that this one is a Sedan. 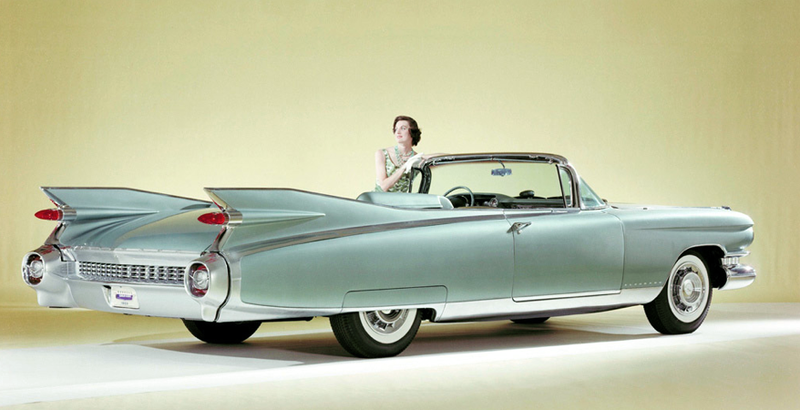 In all at least four 1956 Cadillac's were used for this photo shoot. 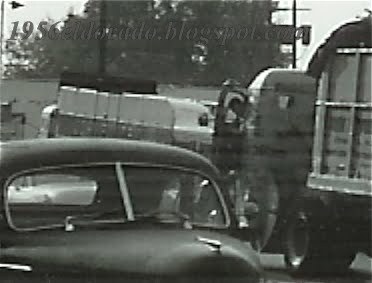 The reason these two trucks had to double park was because another truck was in the middle of unloading the '56 Cadillac it transported. Check out the great lengths Cadillac went through to conceal the cars. Also, notice the warm weather conditions, no one is wearing jackets and the building across the street has many windows open. Some of you may have noticed that the car in the picture above does not have a top. Could that be an Eldorado Biarritz? Well, yes it is! Look at the trouble they went through to conceal the car! Would you drive that brand new car down a ramp like that!?!? Take a peek over the shoulder of the gentleman standing on the right. One car is already in the building and covered. 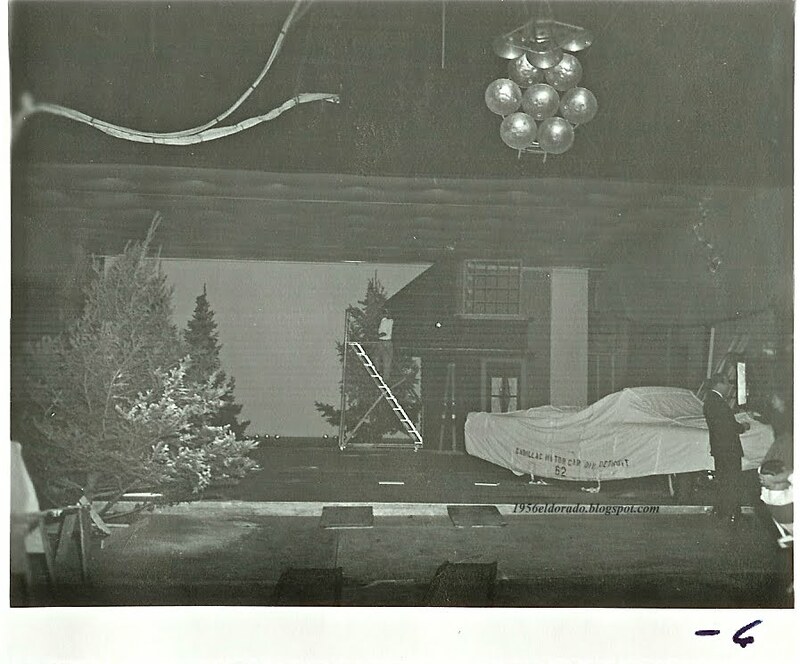 Once the car was unloaded it was driven on to the studio set and put to the side while the stage was set. Again, nothing was left to chance. The car was entirely covered up while waiting for it's turn in front of the camera. In the blow up on the left, you can see the silhouette of the Biarritz along with the clear indication of whom the car belongs to. Click on both to enlarge. 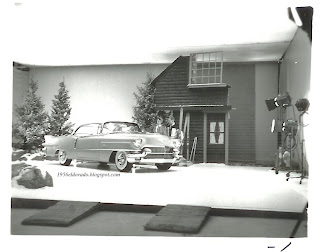 If that stage set looks familiar it is because it was used for the 1956 Sedan pictures. 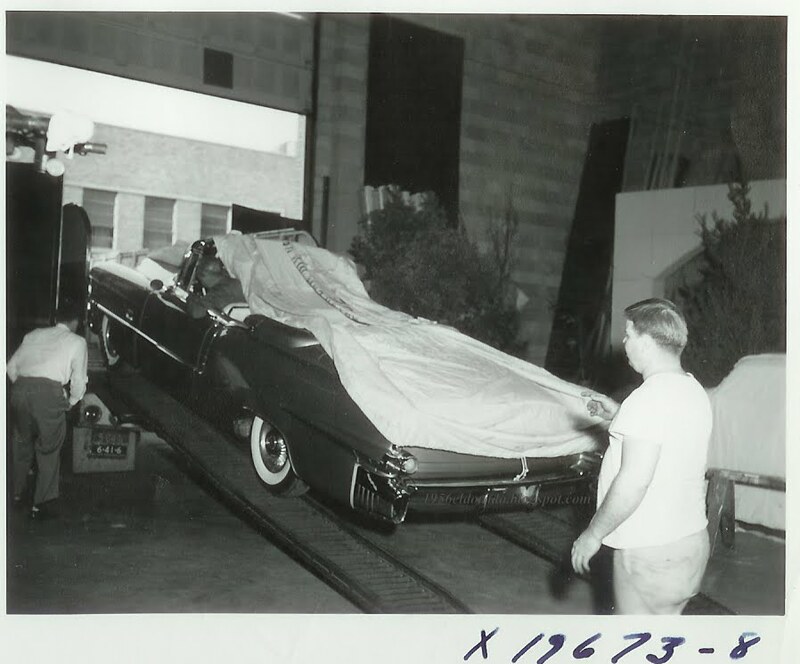 It looks like Cadillac also tried to use the same set for the Eldorado Seville but I never did see finished pictures to support it. 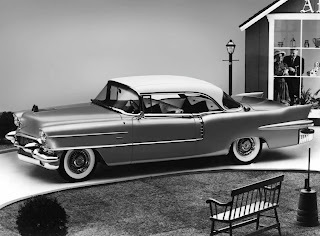 In the end, each Cadillac was photographed in it's own setting. The Eldorado Seville was shot in this setting. Click to enlarge photos. The Eldorado Biarritz stage setting was a polo theme as opposed to the shopping theme of the Seville. Many different versions were photographed. So is this Biarritz body #1? I can't say with absolute certainty but there is no doubt that this Biarritz must have been part of the first run of 1956 Cadillacs built in the summer of 1955. Eldorado Biarritz Body #1 Pictured here. 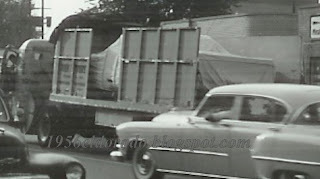 I recently acquired the built sheet to the first 1956 Cadillacs. This is a great historical document on it's own but it also shows us the details to the very first 1956 Eldorado Biarritz built. 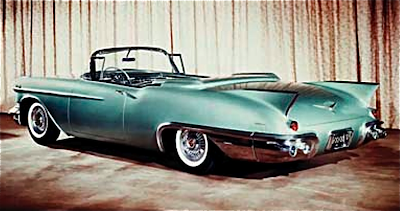 As I suspected Eldorado Biarritz Body #1 was indeed Emerald Green in color with a green and white leather interior & white top. It was equipped with a Gold grille, Gold Sabre wheels, EZ-eye glass, Heater and Power trunk. Interesting to note it was not equipped with an Autronic eye or air conditioning. Also important to note, since the Biarritz name was used for the first time in 1956. You're also looking at the very first Cadillac Biarritz EVER built! Here is the built sheet. The first group of cars built in August of 1955 were the pre production models. 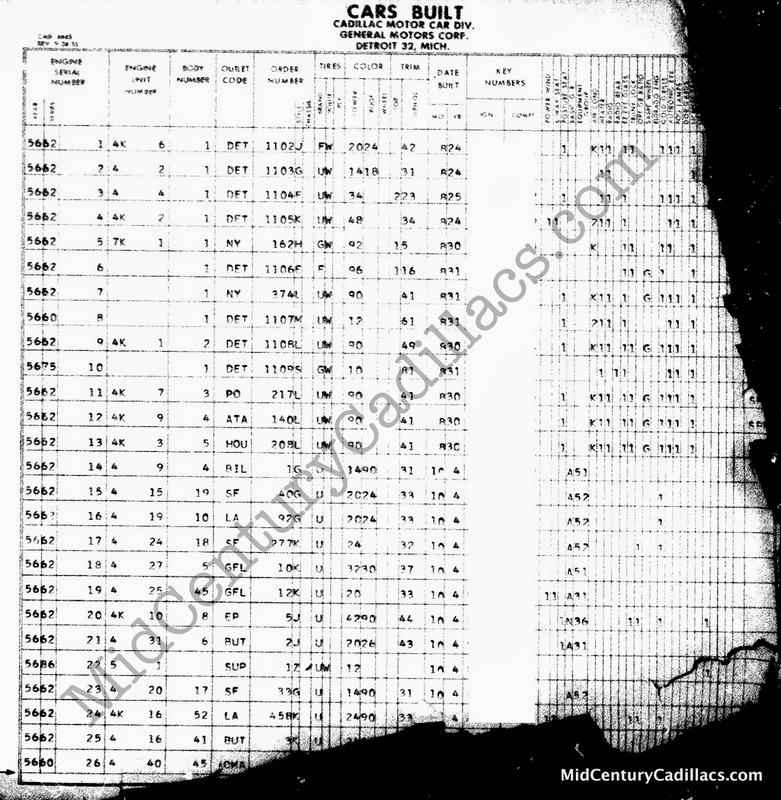 The actual production didn't start until October 4th, 1955 as you can see on the sheet. 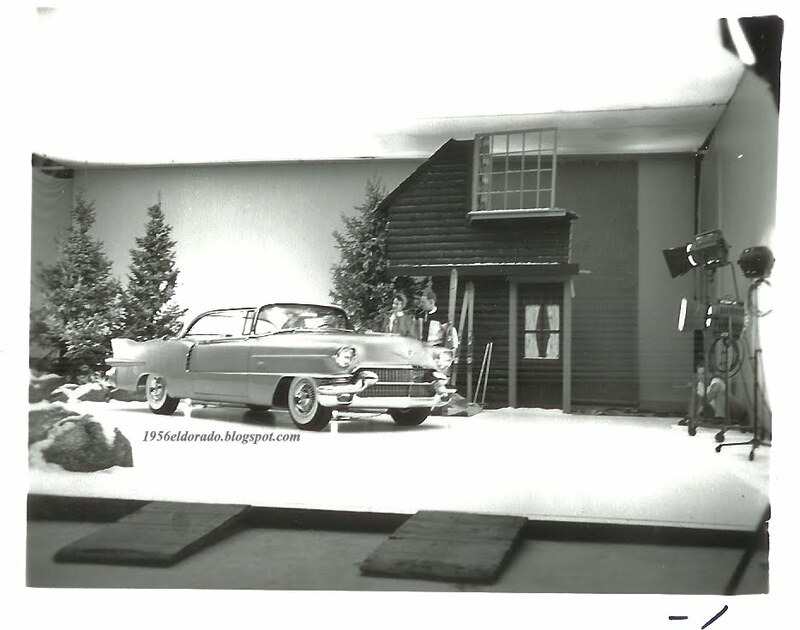 The pre production models were used for promotional photos and testing. 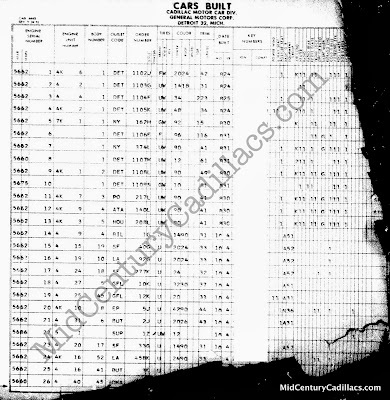 Here is the list of the first run of 1956 Cadillacs built in serial number order. 11, 12, 13. Sedan Devilles in Alpine white which was a special request eldorado color. We can now confirm without a doubt that the first Eldorado Biarritzes built in 1956, 1957 & 1959 were all finished in green paint with green interiors. We know that the first 57 and 59 Eldorado still exists. To date the whereabouts of the first '56 is unknown. If anyone knows what colors the first 54, 55 & 58 Eldorados were, please contact me. 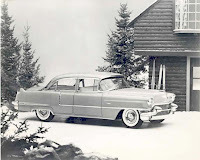 If you are reading this and have a 1956 Cadillac Built sheet please consider sharing it with me. Even if the sheet doesn't have an Eldorado on it. A lot can be ascertained from these sheets. The sheets above are a great example. Once again, thank you for all of the support and contributions. Please keep the info coming!!! 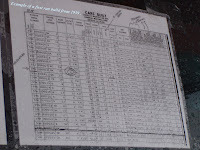 Thanks to Jim Jordan director of the Cadill-Ikes chapter for sharing the numbered photographs from the private collection.